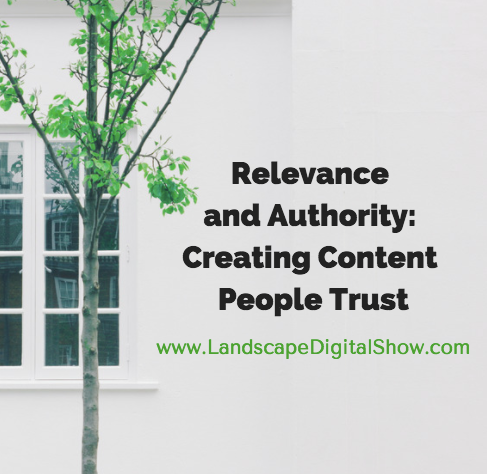 Episode 41 of Landscape Digital Show reveals how creating content people trust depends on the authority of the source and its relevance. 1. Content that is relevant to your target audience. Relevance and authority are what Google uses to determine the content that will see the light of day. Obviously, there are hundreds of secondary factors involved, but what Google presents for search queries is what is most relevant, and that is greatly influenced by the perceived authority of its source. People trust or at least respect authority. Traditionally, this authority is derived from a particular position or testimonial of another person of authority. You have to determine the type of authority that will best serve your business. And you have to be clear about it. You have to choose your authority and make it a consistent theme of the content you create. This is why many businesses struggle with content creation. They take on all kinds of work that fails to stand for something meaningful. Your work should demonstrate expertise in a particular area. And your content should reflect that body of work. This is a combination of the products and services the business offers and the unique experience that accompanies them. Claiming to be an authority in multiple domains is nearly impossible. It just doesn’t ring true with most buyers that are seeking a relationship with a company that seems to be speaking only to them. The best way to determine the right content to create is to talk to your customers one-to-one. And do the same with people you think should be your customers but are not. What are their top challenges? Where do they go for solutions now? How to do they make new discoveries and stay informed? Using their responses you want to create what may be the most important piece of content. And that’s a buyer persona that guides the creation of all future content. What motivates buyers often surprises companies that are in love with their products and services. More important is to fall in love with the buyer personas that become customers by creating content that speaks directly to them. The call to action for this episode is to get clear about your authority and then develop a strategy for creating relevant content that becomes a growing and trusted body of work that speaks to that authority. This article originally appeared in Landscape Digital Institute. This article was written by Jeff Korhan from Business2Community and was legally licensed through the NewsCred publisher network.